Find hotel near Argyle Shore Provincial P .. 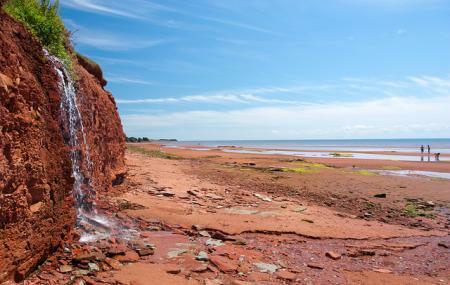 The Argyle Shore Provincial Park situated in Prince Edward Island, Canada is a stunning location with breath-taking views of the beaches and the cliffs. It is a quiet beach, with a set of wooden steps leading down to a narrow strip of sand. The beautiful red sands there would leave you mesmerized with its beauty. You could even enjoy a picnic on the cliffs where you can get stunning views of the surrounding. There’s also a little waterfall and a playground where the kids can enjoy. Visit there during the low tide and you sure would have a fun time there. Argyle Shore is a bit of a hidden gem of PEI's west coast, although it is getting busier in recent years. Be careful when turning in from Rt. 19, it can be easily missed. The beach itself is red-sand and there are plenty of tall cliffs and grassy areas for picnicking. The waves on this side of the Island are usually never large, so it is a great option for families. Great little park and absolutely worth a visit. The sandbars at low tide are a great experience for kids and anybody who enjoys skinny dipping. The park is also terrific for picnics with plenty of picnic tables and well kept toilets. A must if you're near Argyle Shore. This is an amazing park that is free and not crowded at all. At low tide, you can walk out for hundreds of yards and marvel at the red sand an interesting tide pools. The rocks way to the right of the beach are fun to explore and take pictures of. Don't forget to bring a bucket and a gardening spade to dig up clams. There are surf and razor clams here that are sweet and tasty when steamed. Great fun wading in the water and/or through tide pools. Includes a small cold clean waterfall, and red sand that looks really dark in your hand, but washes off easily. Lots of crabs, snails, little shrimpy things, and other fun critters for little kids to find. I think I saw an eel too. Change rooms / bathrooms, small shower to wash sand off, nice little cliff, beach that changes from small (with shallow water to a far distance) to very large with tide pools and daily sculpted sands.